What Is A Pooper Scooper? Dog poop clean-up is our specialty! Your professional Houston Pooper Scoopers to the rescue! Our uniformed team keeps your yard fresh, clean and green, while providing a healthier and eco-friendly area for your family and pets. From town homes to apartment complexes, Poo The Rescue has your residential and commercial pet waste removal services covered. We are fully insured, bonded and trained! Get an instant online quote today! Simple, professional Service. No Hassles, No contracts. 100% satisfaction! If you aren’t happy, neither are we. That’s why we offer our service with a 100% satisfaction guarantee. If you feel our service didn’t live up to it’s high standards, we will come back out to your home and make sure we get the job done right. Your visit will also be free of charge. What are you waiting for? Sit back, relax, and let us Scoop for you! "I love the fact that I don't have to be home and my yard can be cleaned. 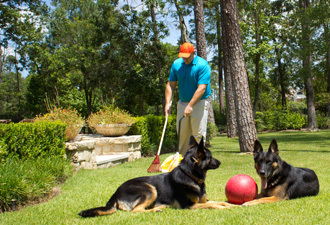 My kids love that they can go play in the backyard and not have to worry about stepping in Rocky's mess." "Awesome service. I love my dog, but hate picking up after him. Now I don't even think about it. Will be a customer for the long haul! Thanks!" "Just what I needed. No hassles. I love the automatic billing option."